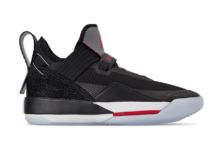 All-Star Weekend is less than a month away, and it looks like Jordan Brand will be releasing the perfect Air Jordan 33 for the occasion, which is held in Michael Jordan’s hometown, Charlotte, North Carolina. Dressed in a Black and Metallic Silver color scheme. This Air Jordan XXXIII matches what’s said to be this year’s 2019 NBA All-Star Game uniforms. Highlighted with its Metallic Silver overlay with Red and Blue accents to match the trimming on the uniforms that is meant to be a nod from the 1991 All-Star Game in Charlotte. Additional details includes stars with crown logos behind the tongue tabs, Nike Air heel tabs, graphic insoles that’s also used beneath the translucent outsole. Ahead of All-Star Weekend, look for this Air Jordan 33 to release on January 24th at select Jordan Brand retailers and Nike.com. The retail price tag is set at $175 USD.